SGB-SMIT POWER MATLA is owned by SGB-SMIT (GmbH) and Power Matla. SGB-SMIT, is the largest independent and pure-play transformer manufacturer in the world, with headquarters in Regensburg, Germany. They are represented on 3 continents in 8 countries with plants in Germany, the Netherlands, USA, Romania, Malaysia, India, China and the Czech Republic. With transformer expertise since 1913 they produce transformers ranging from 50 kVA up to 1,200 MVA. More information on the SGB-SMIT Group is available here. Power Matla (Pty) Ltd is a locally owned black empowered company with investments in various portfolios within the renewable energy, ICT, mining and power utilities markets providing good shareholder value and solid returns. More information on Power Matla can be found here. The power transformer business, which originated in the Swedish ASEA stable was established in South Africa in 1944 and has become dominant in that market. For a period from 1988 to 1992 the company was known as Brown Boveri Technologies (BBT) before the name changed to ABB Powertech Transformers in 1997. In 2008 the name changed to Powertech Transformers and on 1 August 2018 to SGB-SMIT POWER MATLA. SGB-SMIT POWER MATLA supplies a full range of transformers, from generator step-up to transmission and distribution transformers. The range includes three-phase and single-phase units, auto-transformers, arc-furnace, locomotive and traction transformers, miniature sub-stations, NECRT’s as well as shunt reactors. SGB-SMIT POWER MATLA also supplies to the renewable power market which has resulted in orders being placed for several projects. Every SGB-SMIT POWER MATLA unit is custom-made from standardised design elements and using uniform manufacturing operations. This flexible, but well co-ordinated approach ensures the highest quality of design and construction for all our transformers and makes the best possible use of the valuable knowledge and experience gained over the years and best practices developed in our factory. Power and distribution transformers for the African continent are manufactured by SGB-SMIT POWER MATLA in its factories in Pretoria and Cape Town. The power transformer factory in Pretoria West is a well-equipped factory and is amongst the biggest and most sophisticated transformer manufacturing plants within the Southern Hemisphere and one of two large manufacturers within sub-Saharan Africa. 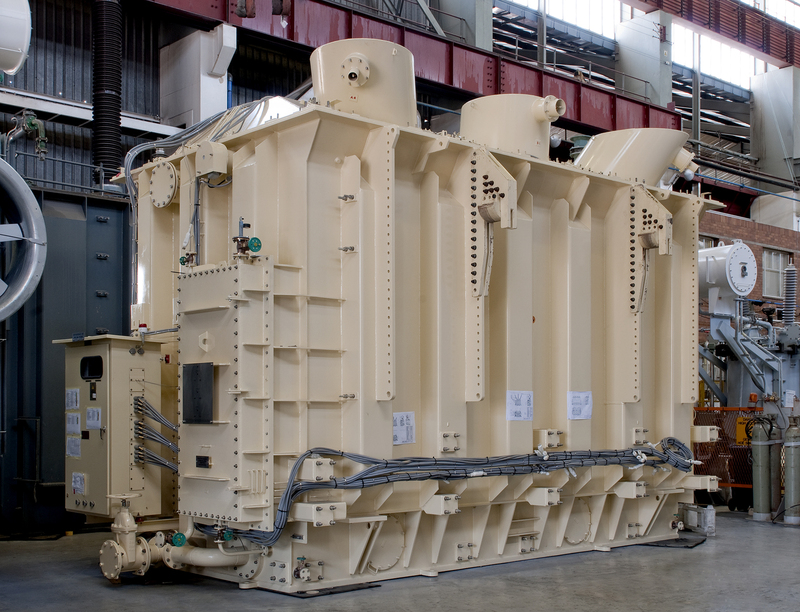 The Pretoria operation manufactures 10 MVA to 800 MVA transformers with primary voltages of up to 420 kV. Other products include generator step-up, arc-furnace, on-board locomotive and grid-connected traction transformers as well as shunt reactors up to 100 MVAr. SGB-SMIT POWER MATLA is also one of South Africa’s largest and most experienced manufacturers of distribution transformers. Designed, tried and tested under the harshest of African conditions, our distribution transformers and miniature substations have proven themselves for more than 60 years. Our experience ensures our products are manufactured to meet the needs of local conditions whilst meeting all major national and international standards. Our products are used in utilities, local authorities, mines, industrial plants and motor manufacturers. Our distribution transformer range starts at 16kVA to 5 MVA transformers with primary voltages of up to 132 kV and 200 kVA to 5000 kVA miniature substations with primary voltages of up to 36 kV. Our product range includes neutral earthing resistors (NER’s), neutral earthing compensators (NEC’s) and NECRT combinations. The greatest efficiency gains lie in improving the way people work together. To harness this potential, we have redirected the way our company thinks. By being customer centric and finding out what our customers need, and then examining and even changing the way we work in order to achieve this is of utmost importance to us. Over the years, this shift in mind-set has enabled us to develop important new skills, along with improved motivation of our people and greater individual responsibility. This has dramatically improved our own efficiency, which means we can bring more efficient new technology on stream more quickly. SGB-SMIT POWER MATLA’s philosophy encapsulates the belief in harnessing synergies which enable proximity to our customers and being able to address any or all requests. We work together with our customers to understand and satisfy their unique requirements. If needed, our technology partner can be called upon to provide world-wide expertise. Advanced manufacturing practices perfected within our company are distributed throughout our operations to ensure the highest construction standards. At the same time, we draw on our own specialised knowledge of local markets and requirements to ensure that our technology is put to the best use in meeting specific customer needs. The very best design and manufacturing facilities, a large bank of experience and a wealth of research work would mean little for our customers if we did not also have the people to apply this vast potential to meet their individual needs. That is why SGB-SMIT POWER MATLA attributes significant importance to our employees. The people who are close to the customer and able to understand and interpret their requirements; the leading engineers who translate this understanding into optimal designs; the experienced co-ordinators and engineers who transport and install the finished products – all these and many other SGB-SMIT POWER MATLA people lie behind the success of every product and installation thereof. The importance we place on these individuals is reflected in our recruitment policies, training programmes and many other aspects of our Human Capital strategies. For example, the value of individual employees contributions is built into the design and manufacturing process itself. In the factory, every operation, down to the smallest detail is signed off on a quality assurance record card by the person doing that job. In this way all the people involved in the design and construction of our transformers for example, exercise responsibility for their own contributions. At the end of a project, all of these cards are assembled into a single binder, which provides a detailed record of the unit’s construction and is stored for future reference. It bears eloquent testimony to the care and effort that so many of our people have put into the project. Over the years, we have been successful in developing the ability to effectively manage the complex interfaces between people, processes and technology. Further details of learnerships, vacancies etc can be obtained from our Human Capital Department on +27 12 318 9911. SGB-SMIT POWER MATLA has many years of experience in the design, manufacturing, installation and commissioning of small, medium and large power transformers for various applications. A transformer is a static device with two or more windings that are linked to each other by means of a strong magnetic field. Transformers are designed for specific purposes. The design requirements of transformers depend on the application. Large power stations where the electric energy is generated are often situated far away from the numerous places where the energy is consumed. Therefore it is vitally important that proper maintenance and checks are done on transformers to ensure that they are operating correctly. It is recommended that during the first year of operation the checks should be carried out frequently. Considerations whether the transformer must be isolated, energized or loaded during maintenance must also be taken into account. SGB-SMIT POWER MATLA offers a transformer design and manufacturing training course which covers various elements of power transformers over a five day period. The course covers design processes, both electrical and mechanical; fabrication; insulation; paper-lapping; core-cutting; core stacking, winding manufacture; winding assembly; quality assurance and control; factory testing; active part assembly; oil processing and tanking; protection components, first line maintenance and transport and dispatch of the transformers. Ongoing market research ensures that SGB-SMIT POWER MATLA’s efforts remain aligned with the constantly changing demands of the market and expectations of our customer base. Because an investment in our products is an investment in the long term, we believe in building and maintaining sustainable relationships with our customers. We have Key Account Managers who are responsible for various sectors of industry. After sales follow-up is an important part of our group marketing strategy. This ensures that our service has been acceptable and that no loose ends are left untied. Keeping customers updated regarding new product developments and market trends is seen as a further responsibility. We are proud of our company and its reputation and work on preserving this image and building on it. SGB-SMIT POWER MATLA’s management and employees believe it is the right of every person to work and live in a safe and healthy environment. We recognise that the long-term future of our operations depends on the sustainable use of natural resources and on the good health and well being of our employees and the broader community. We therefore regard safety, health, quality and environmental issues as an integral part of our operations and consider continual improvement of our SHEQ performance to be a key business objective. SGB-SMIT POWER MATLA is aware that, in the industries that we serve, we play an enormous role in environmental management. Environmental management policies have been integrated into our activities as well as strategic plans on our Pretoria and Cape Town operations. We have implemented the international environmental standard ISO 14001 throughout and for our products by the development of Environmental Declarations. At our Pretoria operation we handle large volumes of transformer oil but are confident that, under the control of our Environmental Management Program (EMP) and a dedicated Environmental Task Team (ETT), sufficient controls have been developed and instituted, even under emergency situations, to minimise or eliminate possible pollution to soil and/or water. Quality control is reviewed very seriously within SGB-SMIT POWER MATLA and all facets of the manufacturing process as well as other processes form part of a documented system which is audited according to legislation. Both the Pretoria and Cape Town factories have documented quality control systems as well as having ISO 9001 certification. The major benefit is that, by implementing and/or maintaining this, we can focus all our actions on what is important to be successful as an organisation as well as satisfying customer needs. SGB-SMIT POWER MATLA (previously known as Powertech Transformers) has for many decades been a household name in the transformer industry. Our organisation is able to capitalise on synergies as well as our combined strengths in all aspects of the business, ultimately leading to improved customer service. We had started embracing Broad-Based Black Economic Empowerment as a business imperative long before the country’s legislation came into being. Power Matla, our main shareholder, has been our B-BBEE partner for many years and contributes actively to the business. SGB-SMIT POWER MATLA Distribution Transformers Cape Town is accredited as a registered training facility by MERSETA and offers training in LV and HV windings as well as core building and assembly. SGB-SMIT POWER MATLA Large Power Transformers Pretoria operation is currently the only training facility in South Africa accredited to provide skills training against registered national unit standards in the disciplines linked to and embodied in transformer manufacturing including basic welding. Registered on the MERSETA database both facilities together provide accredited training in 11 national unit standards. SGB-SMIT POWER MATLA believe in supporting emerging black businesses in a way that will ensure their sustainability over the longer term, by providing management advice, guiding them in financial best practice and providing assistance through advantageous payment terms, to mention a few. This not only benefits historically disadvantaged members of society, but also provides us with reliable, alternative procurement sources for many of our products. Here are a few of the initiatives that we have been involved in. The manufacture of marshalling kiosks (a transformer component which requires panel wiring) was identified as an enterprise development project. We outsourced this production to a company which was initially set up of existing employees working in this area together with Tshwane Motlhagase. The new company started trading in 2011 and has since then yielded positive results. In 2010, we outsourced our external mail service to an ex-employee, Frans Phasani, and his company Vhakhethwa Courier Services which is based in Pretoria West. Living through Learning (LTL) is a registered NPO/PBO in the education sector assisting in the literacy and technical subject sectors. Located in Wynberg, Cape Town. Their aim is to uplift and equip disadvantaged educators and learners with the requisite skills to succeed in schooling. This facility in Wynberg in Cape Town has a Literacy Reading Adventure Room which affords educators and learners a way of boosting their English literacy levels as well as putting back the fun in learning. Carel du Toit Trust – raises funds to ensure the sustainability of the services of the Carel du Toit Centre in Parow, Cape Town, where children with hearing impairments are fitted with appropriate hearing technology and learn to speak. This Centre is the only facility of its kind in the Western Cape to offer deaf children an all-encompassing, structured pre-primary school environment with an early intervention programme and foundation phase. Since established in 1973, the Centre’s belief is that deaf children can learn to speak if a hearing impairment is detected early and there are no other complications. The parent guidance programme offers early intervention to engage, encourage and empower parents to be a partner in teaching the deaf child to speak. In so doing, children with hearing impairments have the opportunity to be intellectually, socially and emotionally prepared for integration into a society of hearing people. Orion Organisation – has been in existence since 1982 and is globally recognised as a well organised and run organisation and has been part of the creation of futures for thousands of disabled people who have been part of the centre over the years. The organisation which is based in Atlantis, Western Cape is dedicated to caring and providing for the educational, training and therapeutic needs of children, youth and adults living with physical, mental, intellectual and neurological disabilities. @2018. SGB-SMIT POWER MATLA. All rights reserved.